Editing environments which feature animated illustrations of model changes facilitate and simplify the comprehension of dynamic systems. Graphs are well suited for representing static models and systems, and graph transformations are the obvious choice for implementing model changes and dynamic aspects. In previous work, we have devised the Animation Modeling Language (AML) as a modeling approach on a higher level. However, AML-based specification could not yet be translated into an implementation automatically. 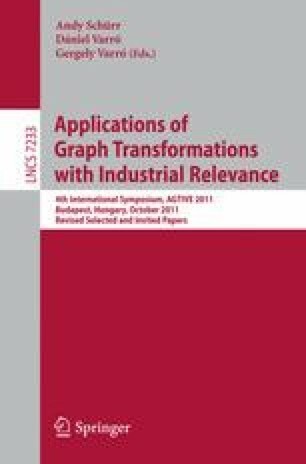 This paper presents a language extension called AML/GT and outlines how AML/GT models can be translated into graph transformation rules automatically and also provides some implementation details.